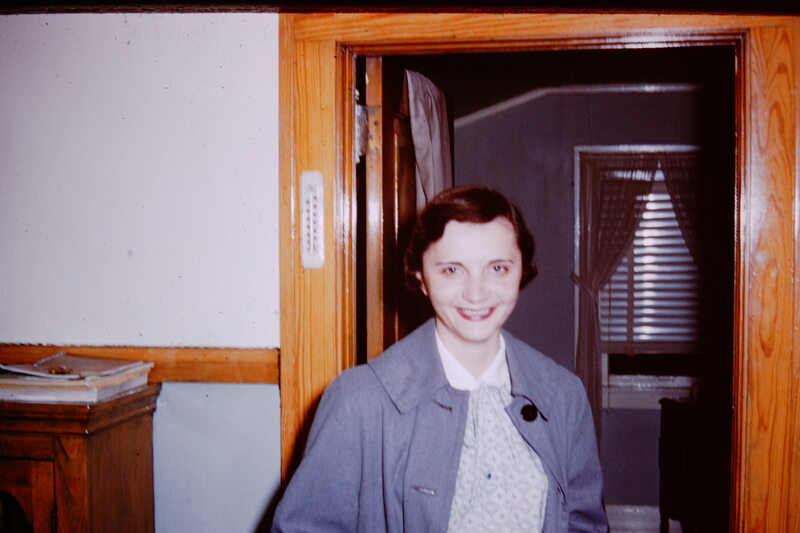 My mother going into the hospital, the night before I was born. Contractions or no contractions, there would be lipstick. That night my mother came to my room – I should say that it used to be my room, and was the room I was staying in then – expecting me to spend the night with her. It was the second to the last night of my visit home, this past July. I had said we could have a sleepover. “But that’s OK if you don’t want to,” she said. She was tentative, like the new girl at school asking to join someone for lunch. I thought I could take the time to check my email, touch base with friends on Facebook. It had been a long day of no contact with the world I had lived most of my adult life in: a world in which I had friends, and a job, and a private life, and a place to spin my thoughts. Here I had: my parents. And there were a lot of thoughts that needed spinning, but no privacy, no time to put the words and images down. I loved my mother – I ached to see her so – but I was feeling mentally, intellectually and emotionally drained. And I had been home less than a week. My father had had eye surgery that morning – “the last thing I’m going to try,” he said. “After that, I’m done.” He has macular degeneration, but the surgery was on his tear ducts, and was supposed to stop his eyes from watering continuously. There was no general anesthesia. He did not feel pain, but he knew what they were doing the entire time. I made a better baby than a shirt. He’d been nervous about the surgery, clearly regretting he’d even agreed to do it. I had watched him get ready for things the night before, without any help from my mother, without any sympathetic recognition of his anxiety. It was a lonely marriage now, between two people who loved each other very much. “The doctor says I have to sleep upright. All night. That means I have to stay down here, and you have to stay upstairs,” he said to my mother. It used to be his refuge, that chair, when he couldn’t sleep, which was often these days. He had a ritual. He would come downstairs around four, turn the gas fire on in the fireplace, cover himself with the polartec blanket. He’d get the remote and turn on the TV to easy listening. He did not look at the screen. Even if he did, he’d seen the ads in the corner so often he did not even notice them. Ads for catheters, for lifesaver bracelets, for scooters At No Cost to You. 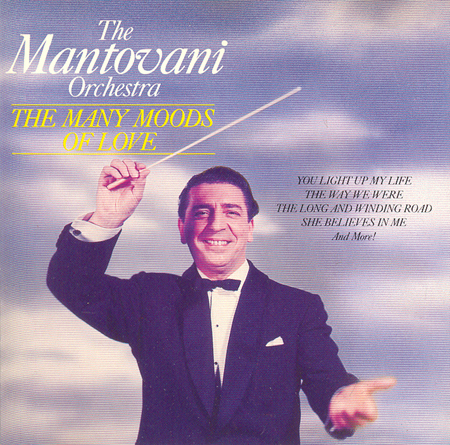 By music he meant The Many Moods of Mantovani; or movie themes, whirled in a blender; or musak Beatles, the orchestrated scores sounding like they’d been stamped into silly putty and stretched beyond recognition. “It’s magic,” my father would say. That trip downstairs had been his sanctuary from the noise of the CPAP machine. The mask made my mother look like a deep see diver, and dive she would. In the early stages of her Alzheimers diagnosis, she would sleep until eight, sometimes even nine – uncharacteristic for a woman who had been an elementary school teacher. But something had changed recently. It triggered a memory of my own. Of being a young mother trying to get some time to myself before the baby or the toddler woke. It was like they could feel awake energy in the house. I loved them – I really did – I just wanted twenty minutes for the coffee, twenty minutes to daydream. But no sooner was I in my chair than I would hear the thump of feet hitting the floor. I remembered my son clambering onto my lap in that oversized Reed Reunion t-shirt he wore as pajamas, on the back porch in our Nashville bungalow. 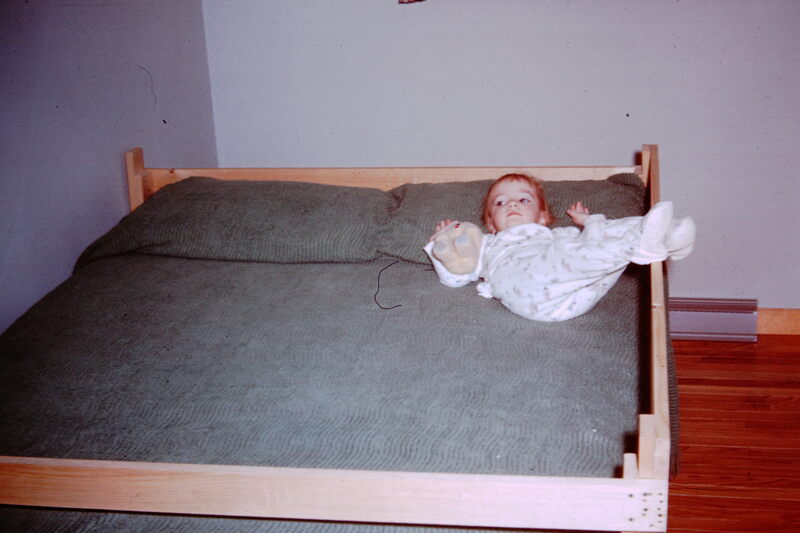 That towhead leaning into my shoulder, the knobby little knees, the legs dangling on either side of mine. Me, sleeping alone in my big bed after my brother was born. Yeah, it was kindof scary. My mother is at my door in her night gown. “I’ll be right there, my mommy.” I call her “my mommy” because my grown daughter still calls me that sometimes, and it makes me happy. “We’re going to have a slumber party!” My mother giggles. I hope if I am there she will feel secure enough to leave him alone, to give him the rest he needs, the time he needs to worry about himself and not her. Tonight she skips the CPAP. I understand this happens on occasion, and it is not a battle I am going to fight. Nor, when she insists she must wear her bra to bed – “They told me I have to wear it ALL the TIME,” do I contradict her. Her leg touches mine briefly as she quiets into sleep, and I wonder if she thinks I’m Alice. She and her younger sister slept in the same bed until my mother graduated from college. I realize I have not shared a bed with anyone in two years, and the last time it was to say goodbye to someone who probably should not have been in that bed in the first place. I did not sleep well then, and I do not sleep well now. Downstairs, despite his longing, neither does my father. This is such a sweet, loving post. I love the mix of the old pix and the story(s). You have a gift for sharing the hard things. Bless you! Thank you, Diana. A late response, but much appreciated. This is so sad… A beautiful, moving piece of writing. It is a sad disease. But I am glad the piece moved you. It helps to see the beauty in sad things. Beautiful, poignant, and so frustrating, Paula. Caregiving is exhausting if it’s for one week or for ten years. I understand letting your mom do what she wants. I have a feel for your dad’s exhaustion. I’m not living with my 99 year-old mother-in-law (whose constitution seems ready to go to 110). I oversee health aids, shop for her groceries, wine, and Depends twice a week, and leave my dog in her apartment while I shop because Willow makes her happier than anything else. When the health aids call with a new scheduling problem or I have to accompany the MIL to one extra doctor visit, I have to sit on a tantrum. I don’t want to do this! I dread the time when I’ll need help. I hope you occasionally get to have a glass of wine with her, Elaine, and it’s not all errands ;-) I certainly get the tantrum-sitting-on – though that’s in a different area of my life these days. 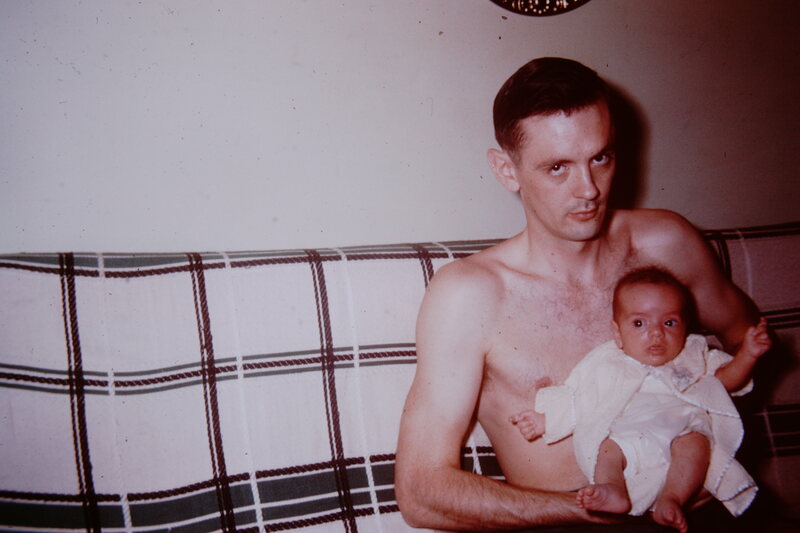 My dad hasn’t been particularly good at sitting on them, partly because of that exhaustion, and partly because that’s never been in his temperament. So poignant. You use such TELLING details. They really hit home. My mother gets odd notions – like wearing a bra to bed – which she claims the doctors told her to do. It can be so difficult but you write about the situation beautifully. You have to pick your battles. This happened in July, and so much has changed since then that I’d almost be happy to have the bra argument again. You’ve written a fair few moving posts about your parents’ ageing, but I reckon this is the most moving moving post so far – thanks for sharing. Paula, such a touching, loving piece. Not only the way you illustrate your Mum’s Alzheimer’s but also all the little excerpts of your Dad’s voice and habits. So simple. So human. So moving. This is beautiful, Paula. Such a touching post about loneliness and being together. Rich detail… Just beautiful. Much appreciated, Sarah. It helped to share it. I’m finding myself imitating her with the lipstick recently – especially as the nights get longer and my work life becomes more tedious. I had a colleague with a poster in her office that said “Slap on a little lipstick, you’ll be fine!” and that sort of fake-it-till-you-make it attitude has taken me a long way. When I showed that picture to my dad after I scanned it (I’ve been doing that with their slides when I visit), he said “She didn’t want me to take that picture; she wanted to GET GOING!” I think she was just this side of terrified. This is such s beautiful, moving post, Paula. As I watch my own mother age, I see her in your words. And you are clearly a wonderful daughter. Thank you for sharing so honestly. Thank you, Mary. It’s hard to be too wonderful this far away… my youngest sister has the bulk of the caregiving for both of them, and I never knew how much strength and sass she had until now. Thank you, Kate. Sorry it took me so long to get back to my last few comments. Much of a muchness this month. Oh, Paula… Having read another bloggers emotional, and exquisitely written post (also about dementia/grief) immediately prior to hopping over to you, I am now struggling to type through the rain. This (also exquisitely written) is such a poignant read. I feel so sad for you, wish it were that we lived closer so that I could hug you up for while. So, so touching. … “My Mommy”… beautiful! Thanks for sharing. I also enjoyed the the old pictures that came with the current story. Thank you Jennifer! My apologies at taking so long to reply.